distribution Strictly in the western and central Coastal Plain, though possibly in the extreme eastern Piedmont (along the Fall Line). Ranges east only to Chowan, Washington, Beaufort, and Bladen counties; and west to Wake, Lee, Moore, and Richmond counties. abundance Difficult to assess because of its high-flying habits. All references consider it to be a scarce, though not necessarily rare, species. Based on the fact that it has been recorded in NC from 21 counties, it certainly isn't overly rare. Best considered as uncommon and very easily overlooked, within its narrow range in the state. flight The flight apparently occurs between early June and late August, though we only have one record before July, and this June record came in 2017.
habitat Small forested seeps and pools, perhaps very small streams. behavior As the common name implies, this emerald is normally seen in flight, typically over head-height to treetop height, along and over forested roads and clearings. Adults normally perch high on twigs of canopy trees. comments This species is most likely one in which a net is required to verify records. An observer may often see high-flying dragonflies during the summer months along forested roads, especially near swamps and other wetlands. Perhaps a moderate number of these (at least in the Coastal Plain) are Treetop Emeralds, but this is only speculation. Getting a good photograph of a Treetop Emerald in a natural pose requires either much luck, much patience, or a strong telephoto lens! Interestingly, our only two records documented with photos are from the same site -- Weymouth Woods Sandhills Nature Preserve, 12 years apart! Comment: Moore; C, 2005-07-04, female, exposure on photos is too hot. 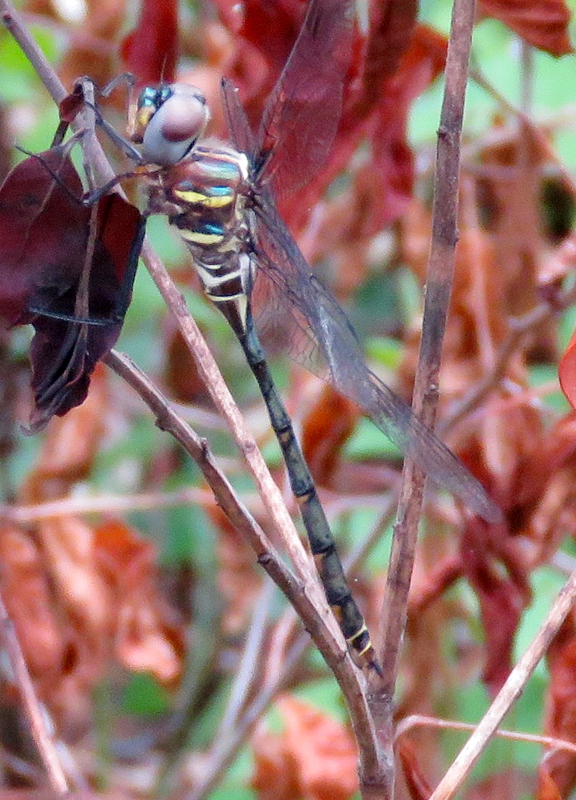 They don't do the bug justice - very beautiful intricate markings on abdomen and first segments.